Everytime I finally get to writing a post I am surprised how much time passed.. Since September, I decided to post updates every month. There are more and more things happening, more open projects, more people working on them.. So I must write continuously. Otherwise the information are condensed and miss the details and opinions I had at that particular time..
1. The pinch seal is difficult to make well without burning internal assembly at the same time. 2. 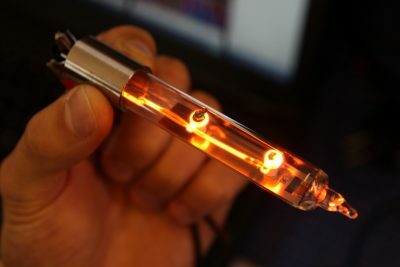 The wires connecting individual dots inside the tube tend to glow. I solved first problem by switching to German made soft glass and Dumet wire (from boro and tungsten), now I don’t need to heat the glass as much and making the pinch is now easier, without risk of damaging internal components. The soft glass has another advantage – it is made in large scale, readily available, produced in very tight tolerances, it is easier to fit internal system in it. 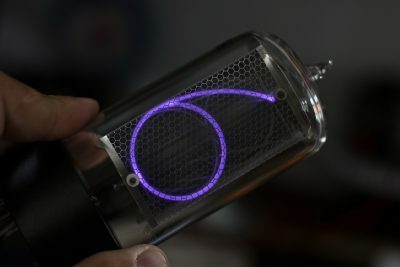 Second problem (glow on internal wires) is solved by tuning gas mixture and burn-in process, now the wires doesn’t glow. 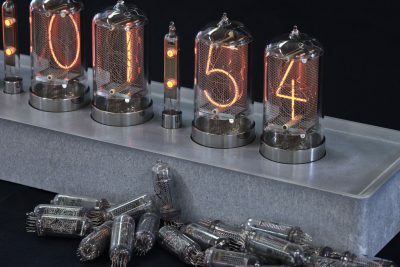 I am starting development of electronics and modified Nixie tube for a clock project called NX.2 for Swiss company Stiftung Fondation Battenberg. The result will be a modern looking clock with some unique traits, the clock body and all other parts will be manufactured in Switzerland. I hire my sister Renata to work as a an office assistant – she would communicatate with our suppliers, solve problems with import/export (customs), would keep track of all parts and material we stock and place orders so we are not running out of parts. We are both worried how will this change our relationship – there are lot of risks when employing a relative.. I am also worried how to transfer all the information, skills and tactis I’ve been learning over the years to a newcomer..
Our iOS app is finished and released, we started collecting feedback for future updates. 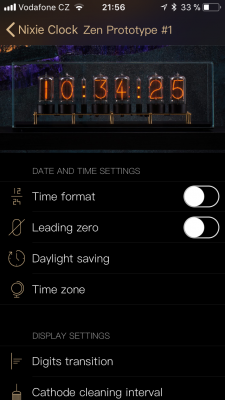 The app simplifies controlling of our clocks and adds some new features (direct access – controlling the clock without connection to internet/our cloud – this will in future clocks replace the rotary knob). Initially, I wasn’t sure if we actually need the app – we already had the web interface. Total cost of the app was USD $7,300 – significant expense for our budget.. 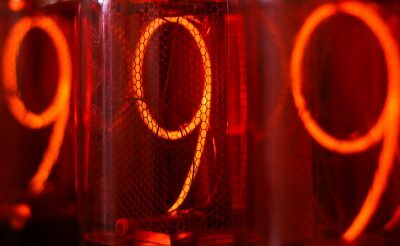 But I wanted to offer more ways how to control the clock, I also wanted to try out hiring someone else for programming (normally I do all the programming) – will it save my time which I can devote to tube/company development? Will it be waste of time and money? You never know until you try.. The conclusion: it was worth the money and time invested – we got working app which our customers like to use, I use it daily as well (it is faster to pull out the phone instead of taking computer and logging into website). There are also some projects I work on which will need its own iOS app – we can share the code and make it less expensive. I learned that hiring a pro to do the job is expensive, but saves significant amount of my own time, I consider it win-win. 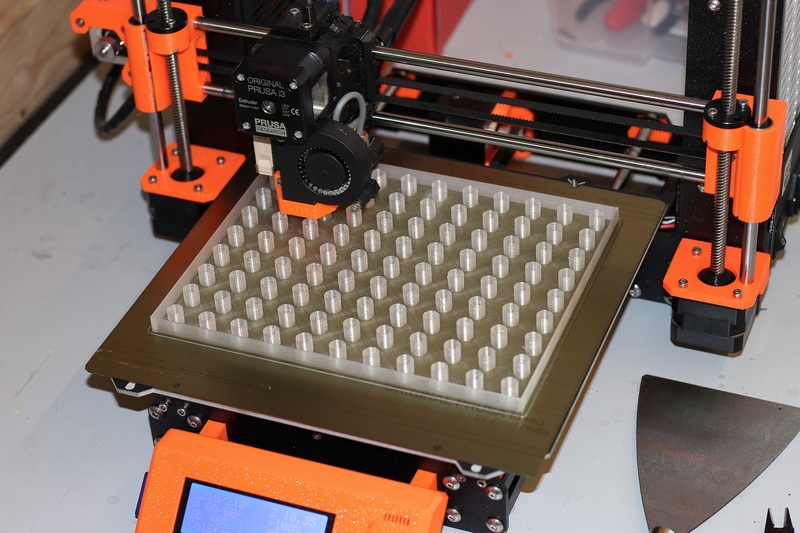 New Prusa i3 MK3 printer arrived and replaced our 2013 Prusa i3 – big improvement. No need to bother with ABS juice anymore, this is the most important feature for me. It also works with 1.75mm filament instead of 3mm one, so there is lower pressure on the filament which results in better grip – no ruined prints because the gear slipped on the filament..
Having this new printer, I start to optimise production process of colon tubes, making welding fixtures, holders, boxes etc..
And yes! 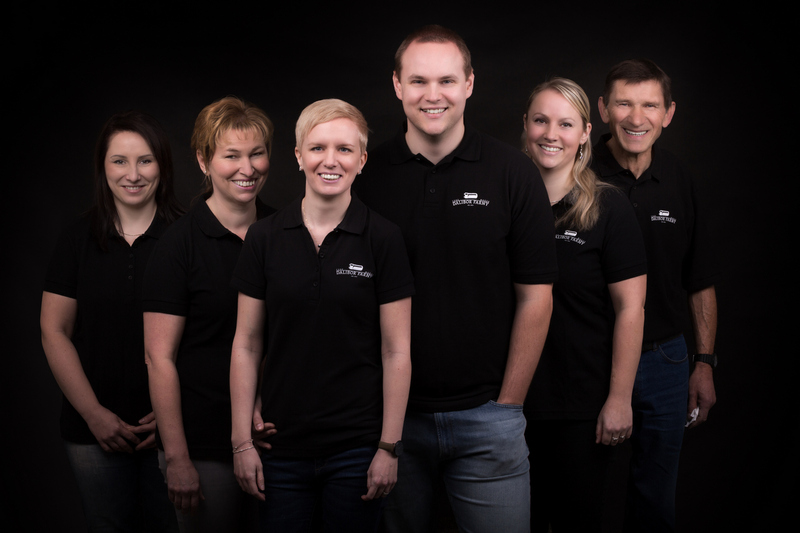 We finally made a photo session for new website.. Jan Skrasek set up a portable studio and made a team photos for us! 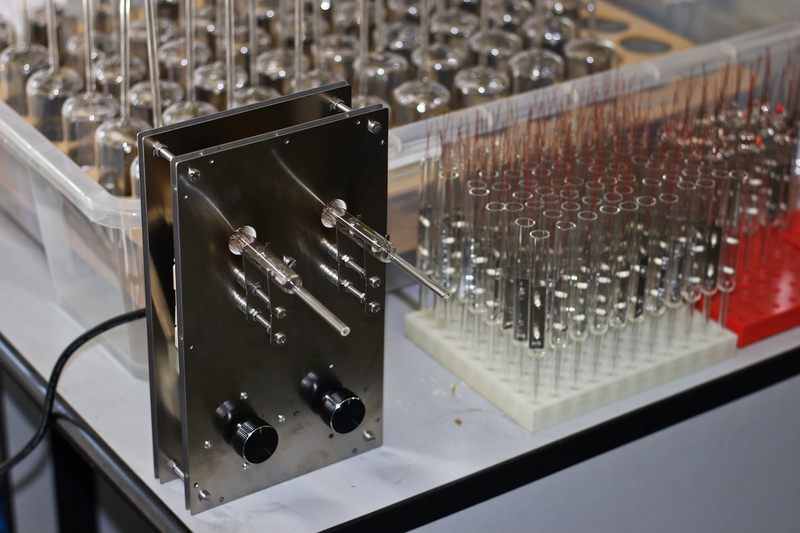 Over half of colon tubes from first batch ends up with cracked glass around the lead-through-wires seal – the residual stress in the glass is too high. I anneal and cool the seal by flames, holding the torch in hand. This is both time ineffective and prone to making mistakes. 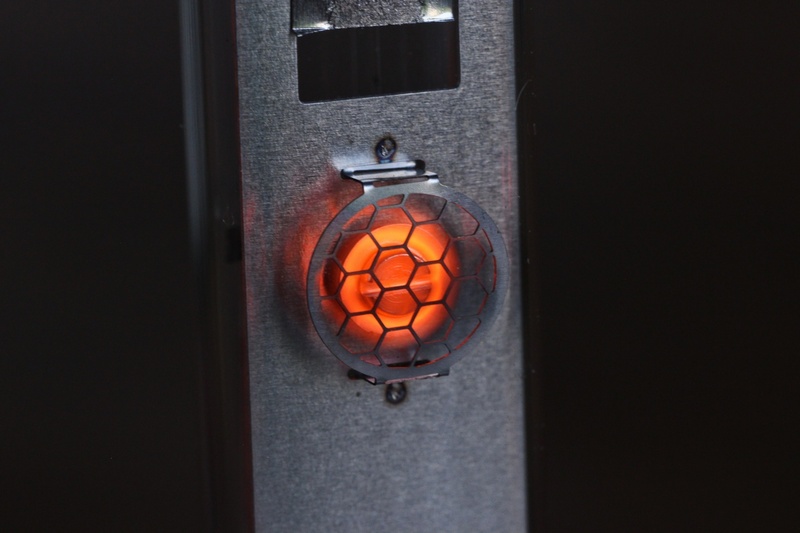 I need to come up with a solution – I build a furnace with two chambers. 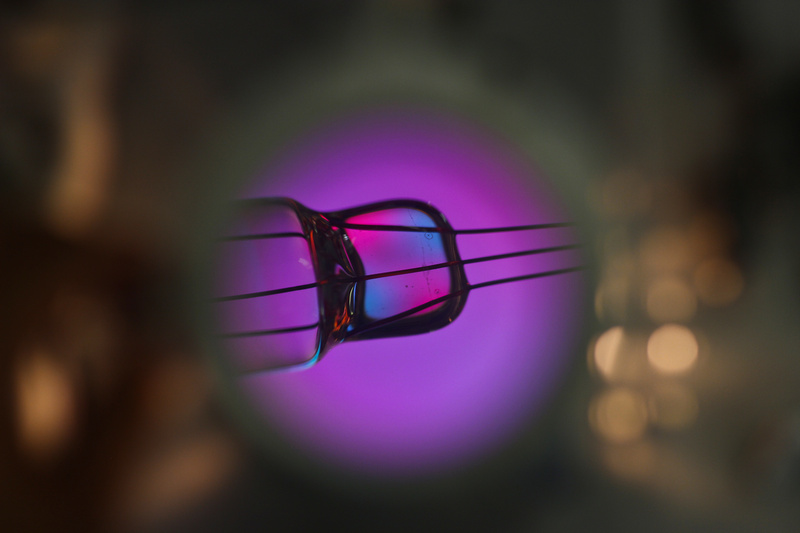 Right after making the seal, the colon tube goes to first chamber with temperature set above upper annealing point of the glass – at this point all internal stress in the glass is relieved. It stays here few minutes (until another seal is made) and then it goes to second chamber with temperature set just below lower annealing point, where it can slowly cool down to safe temperature, then it is removed and cooled down to room temperature without risk of cracking or developing stress in the glass. Using polariscope, I can confirm that there is very little stress left in the glass after the cooling process. Next batch of 50 colon tubes is finished without a single crack, yes! Both my daughters go to ballet. Once per week, we need to bring them to nearby city for their lesson and pick them up when it ends. It is not the occasion where you would expect to discover something useful for a business.. However, one day, Eva (my wife) came from ballet excited, she acquainted a lady living in Brezolupy – the village where is the castle with our lab-workshop. The lady mentioned that her 18 years old son, Radim, studied electrical engineering on high school and did some soldering as a hobby. I asked her to get his phone number next time she goes to ballet – there is lot of work waiting for someone experienced in EE. In cooperation with product designer Adela Bacova, we finish first iteration of packaging for our new Puri clock. 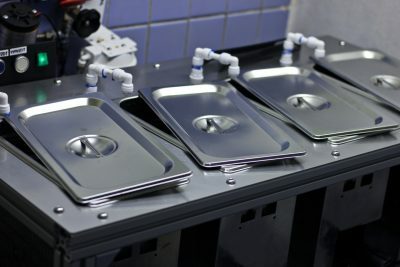 From the design point of view, it is big step forward, customers will like it. We spend lot of time discussing all the details and I often have feeling we are overengineering it and the development of packaging is too expensive. However the result is wonderful and very functional. There are still some bugs, hole for box with power adaptor is too small, the internal foam insert is slightly bigger, bending the paper box outwards. But this will be remade in next versions, making the box perfect. Serious problem was the internal foam insert. We sent the 3D model to our current foam supplier and he refused to make it right away. It took me over half an hour long phone call (I rarely call, always write emails) to persuade him to go into the project. We had to modify shape of the foam to make it less complex and easier to manufacture. It is interesting that they are the only manufacturer of this kind of foam inserts (3D shaped) in our country, all others make the shapes by 2D water jet cutting which is more expensive, less flexible and uglier. I guess it really is difficult to make. 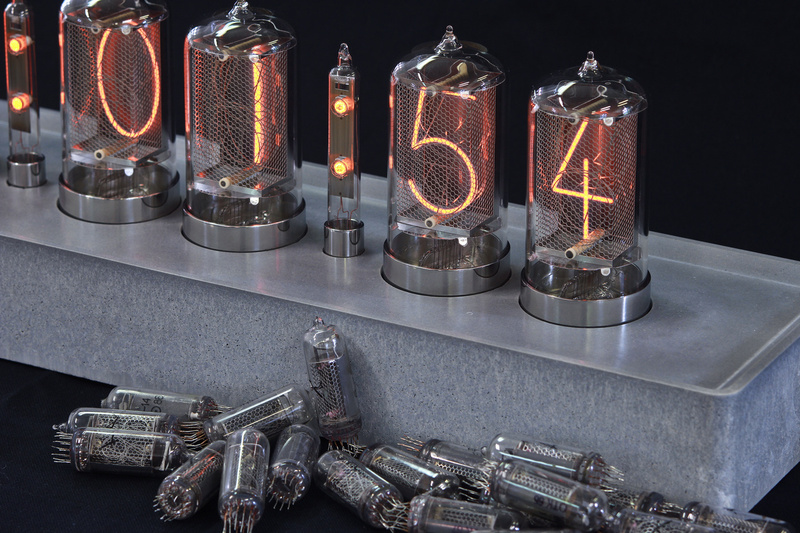 I finish first iterations of a clock board for Puri nixie clock. It is based on Zen clock circuitry, but there are some new elements to test (new HV power supply, shape of the window for wifi signal ..). Owner of the castle (the village) decided to replace old wooden windows. We need to prepare the rooms for windows replacement, all things must be either removed outside or covered with plastic foils – lot of work and time spent on this task. I use this occasion to clean up the storage room which is full of equipment I hoarded to use one day. I get rid of most of it, we need more room there! All windows are replaced and we are looking forward for stable room temperature during winter, thanks to better thermal insulation of new windows. I implemented a NTP sync for our Zen clock, which improved accuracy of the time from 1s window to something like 200ms window. It needs additional development to get better result. 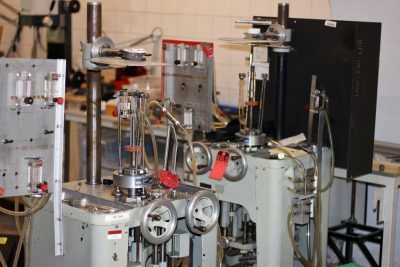 I discovered two tube sealing machines for sale in USA a month ago, both are now standing in our shop, waiting for me to find time to make them working. I plan to use them in future for new tube models – they are easier to operate than sealing tubes manually on a glass lathe. Half year ago, I was invited to first Czech MakerFaire, happening in Prague last week of June. I was hesitating a bit (it means lot of work), but eventually I agree – it is great occasion to meet people face to face, present my work and see the reactions. I am almost all the time closed in the workshop, this will be new experience. I am finishing last objects I want to show on MakerFaire. One of them is modular display – I take 22 individual tube sockets, stack them together and use as one long display. It is impressive and I can’t get enough of it 🙂 Later I want to use this platform for custom builds, the driver is connected to our cloud which can process 3rd parties’ APIs and display value on the display. It can be used for displaying stock values, currency rates, facebook likes, instagram followers and many more. Another project is red coating on our tubes, the red filter enhances readability of the tube and give it kind of mysterious appearance as it is not so easy to see inside the tube – just the glowing digits. I am satisfied how the filter turned out, rich red, smooth surface, well made. I leave it dry overnight and then wrap into bubble wrap. When I unpack it the evening before MakerFaire, I find that the bubbles stick to the red coating, leaving ugly marks on it. Oh my..
Another object is experimental tube filled with argon, I often receive questions regarding possibility of making purple glowing Nixie tube – here it is..
Sebastian (our EE intern from last year) offered he will come to help me on the “booth”.. The MakerFaire took two days, it was super busy, I absolutely didn’t expect so many people coming. I was blown away by support from people, so many of them mentioned they saw our video from manufacture.. I was talking all the time, it was hard to find a moment to eat an apple (the only food I had first day).. Same with Sebastian, he had it more difficult as he speaks only little Czech, but he was doing very well – trying English or German. 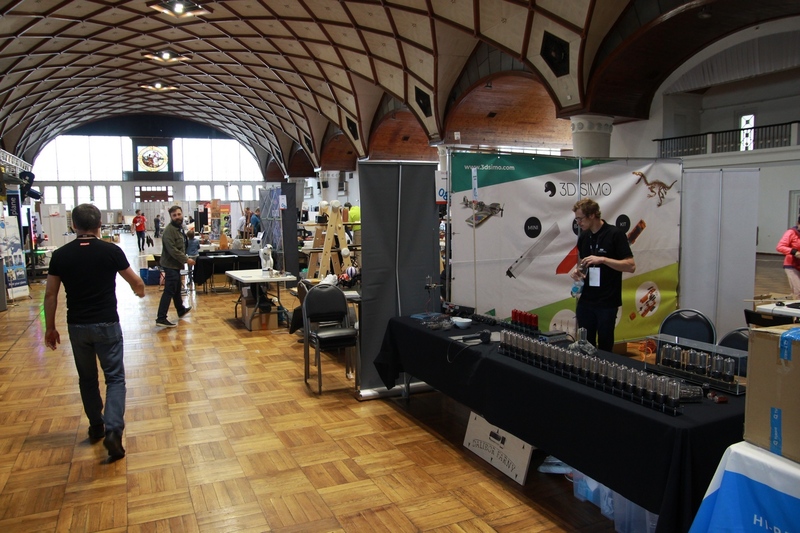 MakerFaire was very important experience, time consuming, but totally worth it. Guys from Creepy studio suggested signing us for Designblok which takes place last week of October in Prague at Industrial Palace. Designblok is top event for design/art lovers in Czech Republic, we will need to come up with nice installation. This time it will be a team work..
After returning from MakerFaire, I called Radim, asked him to come to talk about a possibility to work for us during the summer holidays. 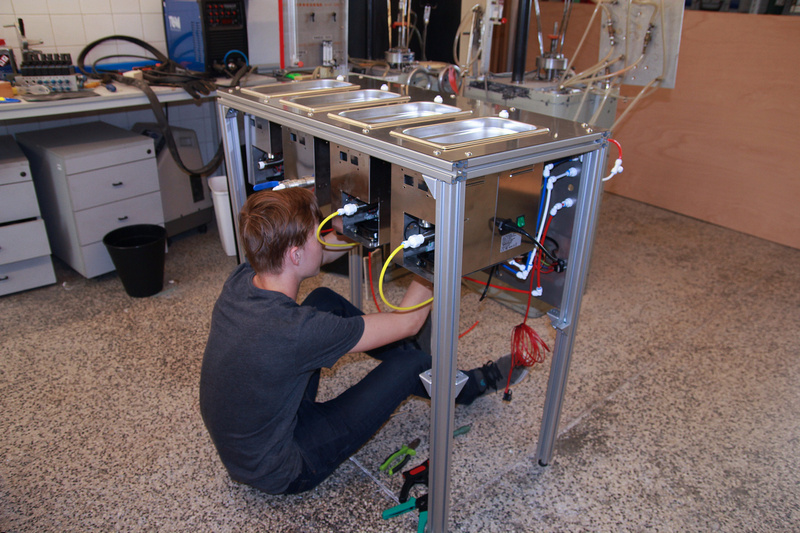 I wanted to find out if he was able to do wiring on ultrasonic cleaning system which I was planning to build. He arrived on time, relaxed young man, I started to dig information from him – what kind of projects he was working on etc.. He was a bit reluctant, but eventually It turned out he is building a processor out of individual digital ICs, and planning to write own operational system for it. I don’t need to ask more questions, he will start tomorrow. Radim does great work, I described him the cleaning system I want to make. He understands it immediately and jumps straight into work. In few weeks, the project is finished, with all the wiring, piping, programming.. Many problems appeared on the way, Radim always come up with a solution. For instance – we need to fill the ultrasonic cleaning tanks with water and automatically shut the water off once the tank is full. No sensor can be used inside the tank (there is no room for it). The pressure of the water differs during a day, not possible to use preset time interval.. Radim eventually incorporates a flow meter, perfect solution. 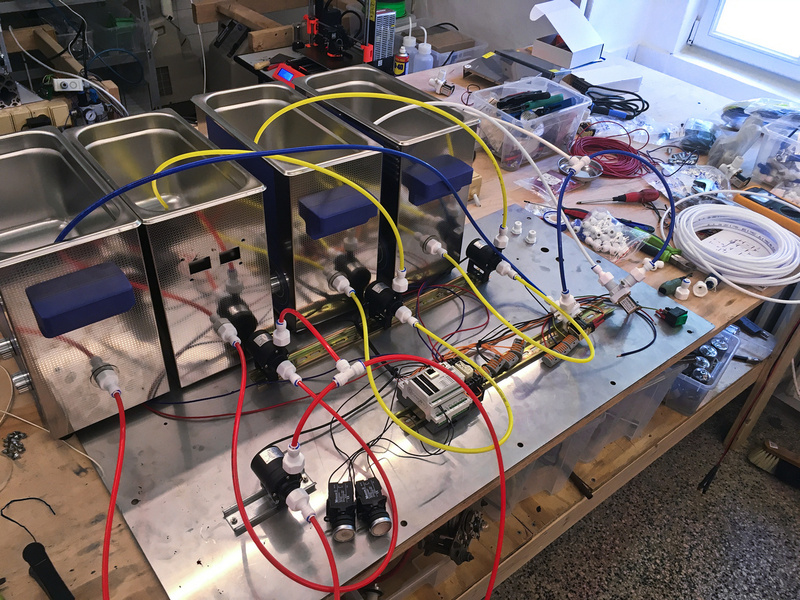 Another issue is draining the tanks – Radim finds a way how to measure current on a pump to determine when the tank is empty, preventing the pump from running dry. It is not easy because the current on the pump has noisy characteristic, but he eventually independently design and builds the circuit. Not bad for a high school student! In cooperation with Gravelli we developed an experimental clock with concrete stand. The main idea behind the clock is contrast between shiny polished tubes and concrete. 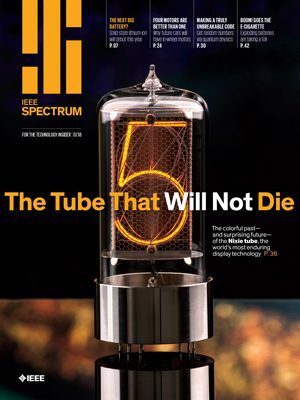 In IEEE Spectrum was published detailed article about history of nixie tubes written by Jens Boos, very nice reading! My nixie tube resurrection efforts are mentioned in the article, together with photos of our tubes – what an honour! Especially when you eventually found out that the article was selected for the cover story! In August I spent 16 days in Canada with my family, it was our biggest vacation so far. Being completely offline for many days, I had plenty of time to think about work and life and plan future. More about this topic in dedicated blogpost.. I spent rest of the August catching up the work I didn’t make when on vacation and more important – preparing for Sebastian to start his 1-year long contract in September!